Cleethorpes has been the home of a range of historic and well known 15 inch gauge locomotives, and below are the details of locomotives you are most likely to find in service on a visit to the railway. 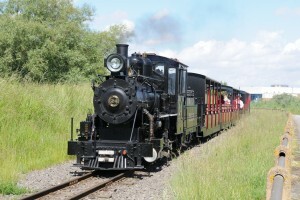 Built originally as a 12 ¼” gauge locomotive for the Fairbourne Railway in North Wales, No.24 is a replica of the USA equivalent. 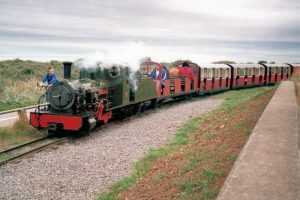 After initial trials in Wales, No.24 was sold to the then newly formed Bure Valley Railway and Kirklees Light Railway, before coming a permanent resident at Cleethorpes Coast Light Railway in 1997. The main workhorse of our fleet, she is capable of pulling the heaviest of our trains and has a very distinctive whistle – on a clear day, it can be heard for miles. Bonnie Dundee began life at Dundee Gas Commissioners in Scotland, built to 2 foot gauge and used for freight haulage over a fourty year period. The late Ian Fraser of Arbroath purchased her for preservation, and she was transferred to the Ravenglass & Eskdale Railway in 1976 where restoration began. As part of this process, she was regauged to 15 inch gauge and side tanks were added. In 1996, the locomotive was rebuilt in its current tender form, and on long term loan from Ravenglass, she is currently under overhaul. This replica locomotive is based on the first built by renowned miniature railway figure Sir Arthur Heywood. At 7 foot long and with a footplate just about big enough for a driver, the original Effie built in 1875, ran for over 3000 miles in its first six years of service. 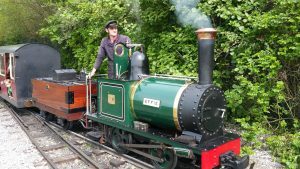 This replica was built using only photos to base its construction on and since completion, Effie has visited railways including the Ravenglass & Eskdale Railway and the Eaton Hall Railway. More recently a tender has been built designed around a Heywood wagon. The railway is also home to a select number of privately owned locomotives, such as 4-4-0 Yvette and LNER 04 Class No.6284. Our diesel fleet includes Rachel ex Fairbourne Railway 0-6-0, DA1 a diesel shunter originating from the Bush Mills Railway and 1944 Lister built tram No.7. The railway is also the base of the Sutton Miniature Railway collection, which consists of three locomotives, ten coaches and a variety of artifacts from the now closed Sutton Miniature Railway.